With a recent anniversary for VR Troopers, you may not have realized another series premiered only a week later in 1994. 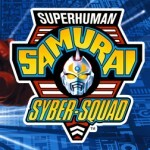 Celebrating it’s 20th Anniversary today is Superhuman Samurai Syber-Squad! Unlike the majority of other 90’s tokusatsu this series was not a Saban production nor was it adapted from a Toei series. Syber-Squad was brought to the US by DIC-Entertainment and was in fact adapted from the Tsuburaya series Denkou Choujin Gridman. The focus was on our main hero Sam Collins who transformed into the digital hero Servo, and along with Team Samurai would enter the digital world to fight the forces of the evil Kilokahn Artificial Intelligence. Though the series never quite had the staying power of it’s Saban competitors Syber-Squad actually still has a decent following today. The original Japanese releases of the DX toy line have become just as expensive if not more so than many Sentai toys released in the same era. And even items from the American counterpart toy line produced by Playmates can still command a high price on the secondary market. Just last year Mill Creek Entertainment released the entirety of Superhuman Samurai Syber-Squad on two DVD sets that can be easily found around the $10 range now.